For many, building a gaming system is all about the processor and video card. People will take the time to research everything about the processor speed or video ram, but when it comes to the sound card that duty is given to the motherboard. In the 90’s almost every gaming rig had a sound blaster inside, but today, far too many leave it up to the mainboard and far too many are missing out. Now, let us be fair, onboard sound can be pretty good. I personally have used on-board sound and I thought it was just fine. The trick is you do not know what you are missing until you try it out and see the difference. It is like going from 720p to 1080p you will notice the difference especially in games with 3D sound effects or where having true surround sound is important. First, we start with the Sound Core3D. This is a quad-core audio processor that allows all the technologies running within the card to function at peak performance. Sometimes you might see within games that you can crank up the sound quality, but it might lower performance, not with this card. 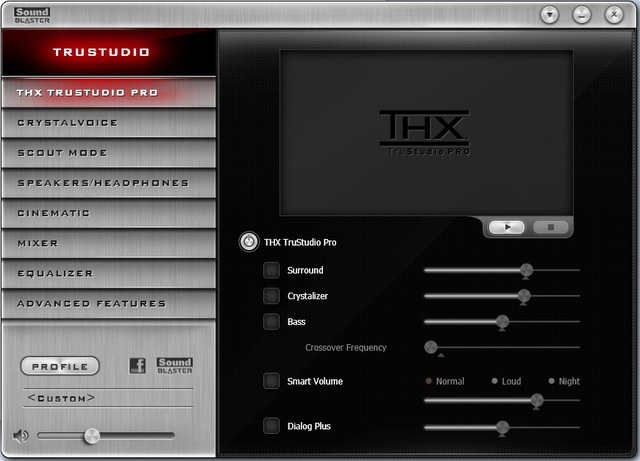 Next, we have the THX TruStudio Pro, which is all about realism. When you are playing a game like Battlefield 3 or World of Tanks, you want the sound of the bullets and explosions to sound real. It is all about immersion and that is what 3D surround sound does, it makes you feel as if you are right there just as much as high resolution graphics does. Crystal voice is all about audio communications, which is so important in today’s games. Ever listen to horrible sounds via Ventrilo, Team Speak or Mumble? It is not always a bad microphone or that the person never uses push to talk. Many of the times, it is just a bad audio card or setup and crystal voice fixes that allowing you to adjust your settings within the control panel so you come through clear without the need to yell. 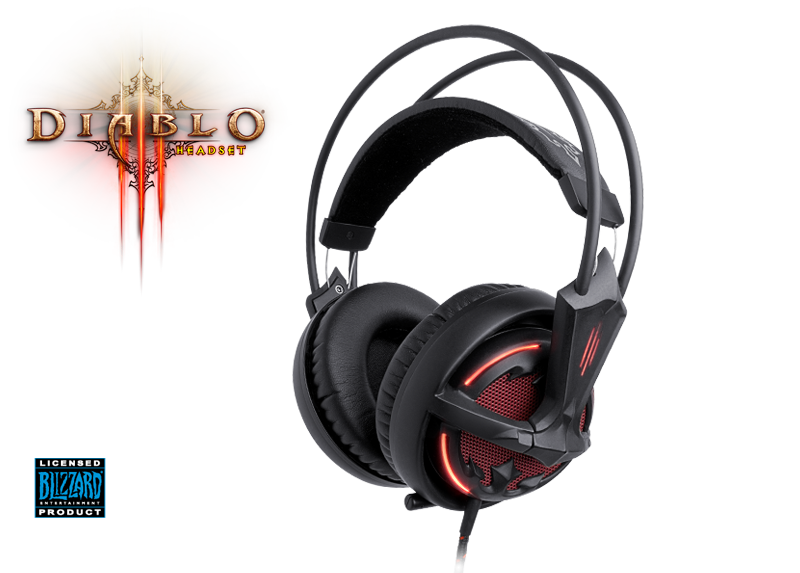 If you have been reading our previous hardware reviews you know I am rocking the Diablo III headset and it works perfectly with the Recon 3D. This card has a dedicated headphone amp that provides the power needed for high quality headphones, which is important since many gamers are spending the big bucks and high-end headsets and the last thing you want is an underpowered device running them. Finally, we have the Dolby Digital Live encoding which allows you to connect your system to a home theater system using a single cable. I personally have not tried this function yet, but for those of you with a home system this could be the perfect piece to finish your setup particularly if you watch television and movies or listen to music within your office. Setting it up was a snap. The back of the card has color-coded connections with clear markings of what goes where. I have a 5.1 speaker system with a center speaker and sub and was able to connect my speakers within moments. 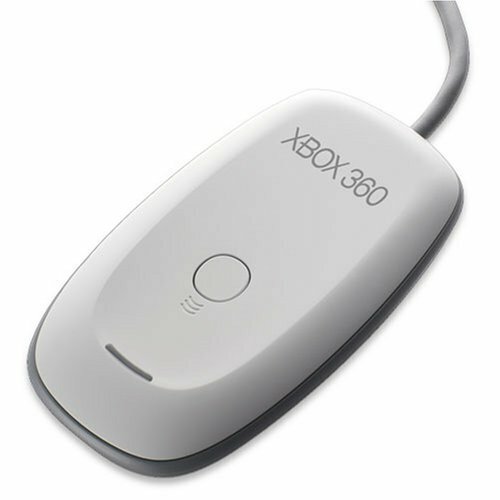 Just remember that if you have existing onboard audio you will want to disable it because Windows will use it by default and you might end up wondering why you do not hear anything. The microphone while small has a very long cable which is good for people like myself with a large desk and I noticed while configuring the mic that I do not have to speak loudly or lean into the mic which is great. 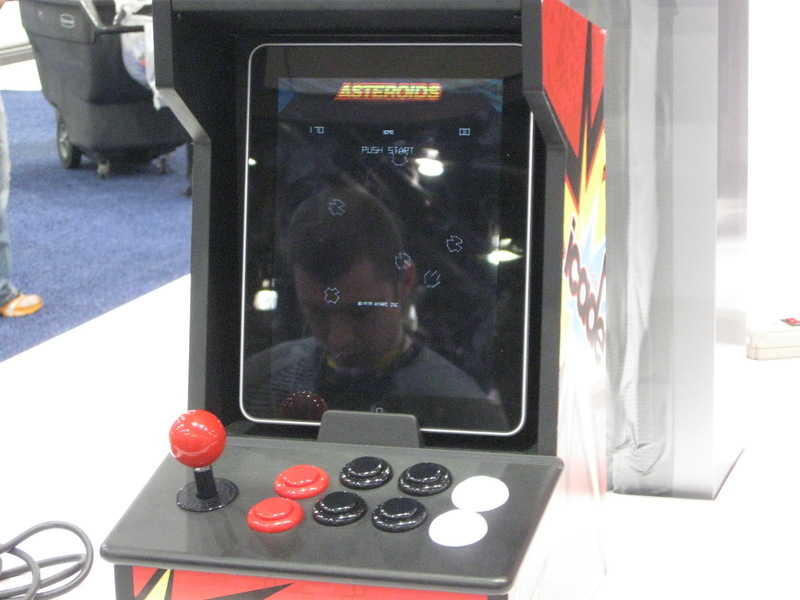 Once the software was installed, I opened up the control panel and viewed the various options for configuration. For the novice, don’t sweat it. There are a lot of settings you can change, but right out the box you will notice the difference in quality without changing anything. 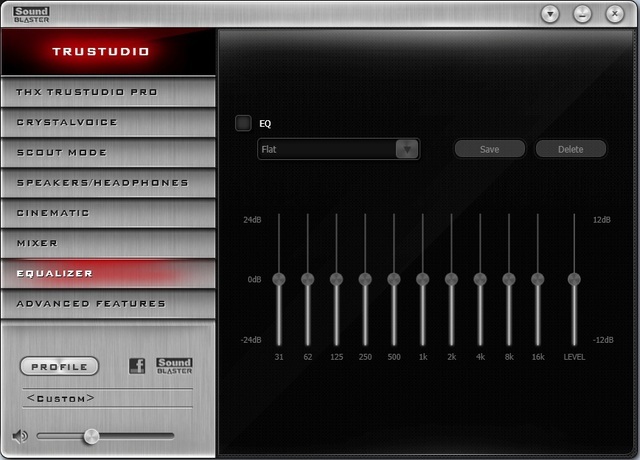 For the most part I only played around with the equalizer because I wanted to create different profiles for games, movies and music and anyone who has ever used Winamp EQ or another audio program will see how to adjust the highs, mids and lows. 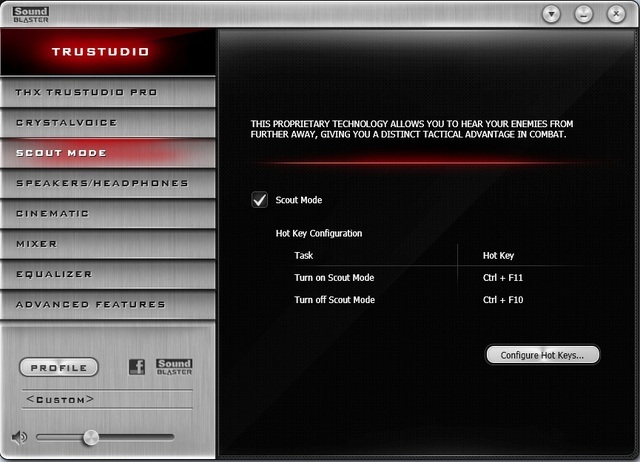 The speaker/headphones setup is also nice because it allows you to adjust for the difference between the two devices. A lot of times you will want to boost the forward speakers or lower the bass with headphones and all this can be done on the fly. 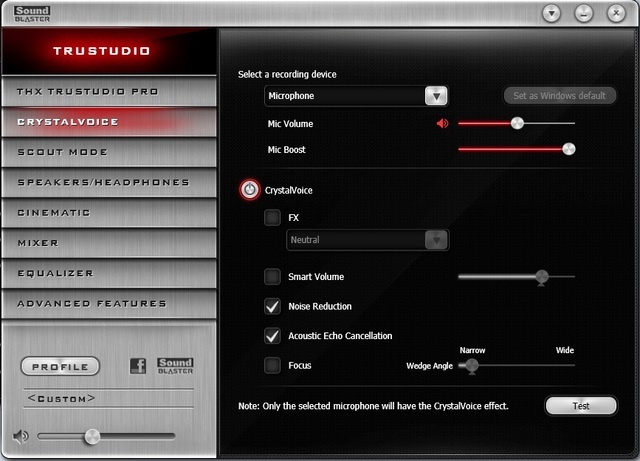 Under the Crystal Voice, settings you can boost your mic output or adjust the noise reduction making sure you sound perfect within games or just normal voice chat. Overall, the Recon 3D Fatal1ty changed my view on sound. I can hear people sneaking up on me in first person shooters and immerse myself in the battle music of SWTOR. 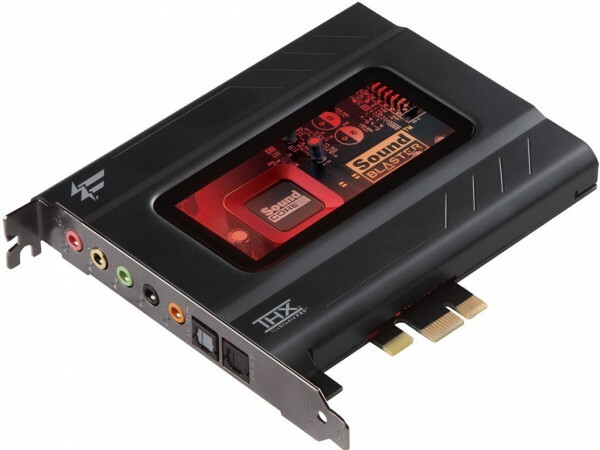 For those of you who take your gaming seriously a top-notch sound card is a must because it does give an advantage just as much as a better monitor or video card does. 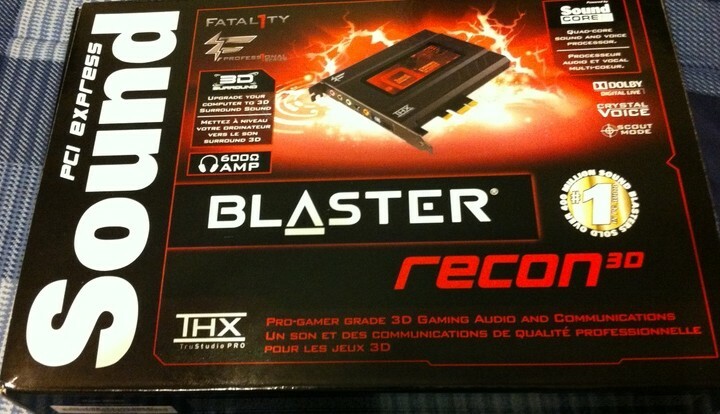 Besides that, being able to enjoy movies and music with high-definition sound truly makes your computer the main entertainment center, so if you spend a lot time with your PC then you want a great audio experience and the Sound Blaster Recon3D Fatal1ty Professional sound card delivers just that. ← Kimbo Slice & Consumer Cellular?